Admit it. I'm your favorite. Christmas in Charleston - A beautiful Charleston December day in the park next to the Citadel. 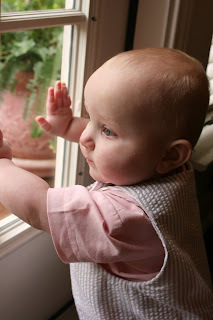 I have three tiny kiddos, and I am loving staying home with them! I love to take pictures and make things, so this blog is a little bit about everything! Happy (almost) First Birthday Kate! Our friend Kate is three days older than the babies...but they are moving to Italy (jealous anyone?) at the end of April, so her grandma (my mom's BFF) wanted to have a little Texas party for her on Sunday. I think my kids are beautiful, and this little girl is right there with them...she has the biggest blue eyes, and BLACK eyelashes...so, so pretty! She loved mashing up her cake and being loved on by everyone! She is a smartie, too...signing for "more", "all done"..she even made up a sign of her own for "drink". Sort if made me feel like I needed to start teaching signs....but with two babies, who has the time?? Thanks to the Swigers for inviting us. 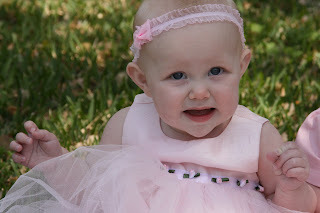 Happy First Birthday (almost) to you sweet baby Kate! We love you and are so glad you are all better!! They were so cute, it almost made up for the fact that the room smelled like the rodeo and I had to change two poopy diapers! -still won't hold their own bottles. -eat all the phase two and SOME phase three foods. 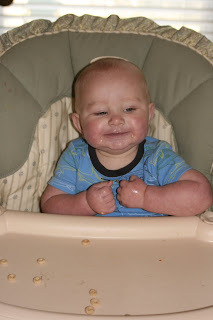 -eat about four hundred cheerios a day. -fuss if they see us making a bottle and we aren't moving fast enough. -manage to get food on the top of their head during a meal....and sometimes in their ears. 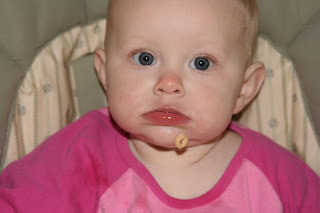 -always have a cheerio in their diaper. -only take three bottles a day now! Yeah!!! We are about to get a raise! -Frantically shake their head "no" and wave their arms in front of their face when they don't want any more food. -spit out anything new the first time they try it. -laugh with their mouth full of food....sadly, we laugh too, and encourage this. -love to drink out of the bottom of a straw. 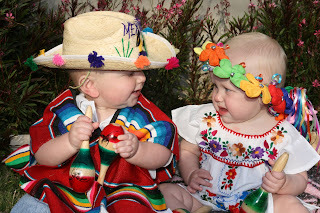 So I set up a little photo op for the babies...I have been wanting to photograph them in their "fiesta" gear so that I can include a picture of them in their first birthday party invites. One afternoon Shawn and I took them outside for pictures....Hayden (as usual) hated the grass and wanted to be picked up...Cale loved his maracas and shook them like there was no tomorrow. I had the great idea to draw a moustache on him (see how we use our babies for entertainment) and Shawn noticed that Cale still had a faded little moustace when we were putting them down for bed that night. Why the eyeliner can't stay on ME that effectively, I have no idea! These pictures cracked us up, and they keep making me laugh! Too bad we had trouble finding one where Hayden didn't look totally p.o'ed. I ordered one big one of Cale with a moustache...all I need to do is frame that picture and look at it everyday and it will cheer me up! I hope that boy is always that silly....and I LOVE Hayden's face in the first one...she is looking at him like, "What the hell is wrong with you?" They always, ALWAYS make me laugh! I had no idea having babies would be this funny!!! 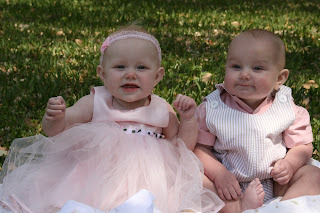 As promised, pictures of my cutie tooties on Easter....notice Hayden holding her hands up lest she accidentally touch a blade of grass...such a girlie girl! She looked like a princess in her dress, but it made her mad because she kept getting her legs tangled in it and couldn't crawl. My mom made Cale's little outfit to match hers...we didn't want it to look girly, and it didn't! It came out so cute...even my husband approved; deeming it "fratty". We ate some yummy food made by Mimi, and visited with Uncle Andrew and his sweet girlfriend Holly. Her parents were here visiting from Iowa, so we got to meet them. They loved the babies so they fit right in! Before babies, Shawn and I would have stayed all day and hung out talking....now, we realized we need to take some baby gear with us to Mimi's, because we spent all day (even during the meal) holding the babies and keeping them from getting into stuff. They need a baby gate or corral wherever we go, or else it is no fun for us! We stayed about three hours and then took them home for naps. It was much shorter than usual, but lots of fun anyway....thanks to mimi for making such a delicious dinner!! p.s. Pictures of babies in beforementioned easter outfits will be coming soon....I can't find them on my mess of a computer! Is anyone else watching the Bachelor? Moreover, is there anyone who is watching this filth and not ashamed to admit it? I am not liking any of the girls at all. I don't remember a time I ever felt like I should break into song on a first date with a guy...what are these girls thinking?? If this is what it takes to snag a man, I am really glad I am off the market. I do sing loudly and often to Shawn, but he is legally obligated to listen to it. This guy just met these freaks and they are making up all sorts of songs for him. One girl even sang opera. Opera! Can you believe that?? Not that it isn't beautiful, but your face looks extremely weird while singing opera. This girl should look in the mirror and see what I am talking about. And now we get really, really embarrassing. I don't even want to type the next one. Let's just say that it is pretty sad when your ten month old's favorite song is the theme to "All My Children". Hayden literally dances when it comes on. I should be reported to the authorities. I need to start reading again! I decided a few weeks ago to paint our bedroom...it was blue, and none of our bedding matched, but I was putting it off because the ceilings are so high that I knew it was going to be a disaster...anyway, I had already bought the paint awhile ago, so I jumped in and started painting on Tuesday....it is about half done and it is a MESS!!!! I paint when the babies are napping, and has been just about as slow going as I had anticipated. No help from Shawn, who claims he was fine with the blue that didn't match anything. (Men!) So anyway, we are having people over for dinner tonight, and my bedroom is half painted, with two ladders in the middle of the room, with the furniture pushed all over the place....oh well! Sort of wondering if I should have just left it the way it was.....but I think the new color is going to be so pretty. I can't believe they are almost a year old! It has gone by so fast....they are getting so big, and everything they do makes us laugh... Except for last night: Hayden decided, while in the tub, that she needed to poop. I was painting and Shawn was bathing them, when I hear, "Hey! Come here and look at this!". I round the corner to see my two sweet babies playing happily while a big old turd is floating in between them...and my husband smiling like it is the funniest thing he has ever seen....Meanwhile, I am concerned that they are going to get contaminated by the turd....namely because Hayden is playing with a cup, and begins to do what looks like drinking poop water. I start hauling babies out of the tub, while he stands there....I think he would have continued bathing them with that turd just floating around. He ended up bathing them in our bathroom, while I was left to fish the poo out of the tub with a cup. The glamorous life I lead....not quite what I imagined when I started this family, but I wouldn't trade it! We are trying to read every night....am I the only cruddy parent who tries but somehow can't fit it in every night? I know it is about to get a lot more important, and I really want the babies to love to read as much as I do. I am really, really, really going to start to make time every night....maybe declaring it on my blog will mean I feel the need to stick to it. I took these pictures today in the front yard...I got the smart idea to buy bunny ears and eggs, and take a cute picture while they are still young enough to allow shenanigans like this. They LOVED the little plastic easter eggs...I guess I don't have to worry about putting something in their easter baskets this year. Empty plastic eggs will do fine! Cale had the best time banging his two eggs together...he even tried to take an egg into the tub with him tonight! Too cute! My sweet babies: I hope you always find joy in little things like this, all the days of your life! I love that you smile and laugh all day long. You are my favorite people!! for every time someone walked past me out in public and said, "Double Trouble, huh?" I could AT LEAST buy myself some new shoes or something. That comment cracks me up....It's most often uttered by old men...apparently that is their comment of choice. Taking the babies out shopping is getting just a tiny bit harder...they want to touch everything we pass by....pulling clothes off hangers, knocking stuff off shelves, etc. Then when you try to take the item they've snagged away...well, watch out. Unhappiness ensues. Worse than the touchy activities are Hayden's problems with strangers...people are trying so hard to be nice, and she tolerates it for about twelve seconds....after that, her eyes start to turn red and her lips start to quiver, even if she is smiling. Sometimes she wholeheartedly screams the offender out of town, other times she has the decency to wait until they are walking away to look at me and cry, as if to say "WHO was that??" If they touch her, they are sure to get the screaming routine. And don't even get me started on moustaches, beards, hats, glasses, etc. If there is even one thing remotely different about the face coming near her, she goes nuts. She is not a fan of facial hair, to say the least. 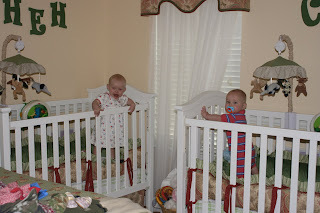 Today for the first time, I found them in their room, both looking out the end of their cribs, "talking" to each other. They were laughing and making a ton of noise.....this is probably when they will start waking each other up! They seem to really notice each other now....they want the toy the other one has, and will jerk it out of each other's hands to get it....they even take the pacifier out of each other's mouth and pop it right in their own. I am getting excited about their first birthday approaching...half of me wants time to creep by as slowly as possible...the other half wants the next two months to hurry up and pass so that they can have whole milk...we are spending about ninety dollars a week on formula, so it will be like a raise when they start drinking milk! 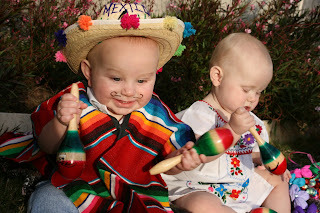 I have started thinking about their little birthday party...we decided we would do a "fiesta" theme, since they were born three days after Cinco de Mayo....plus, I always like an excuse to force my mom to make fajitas...yesterday my mom and I picked Kelly up from the courthouse, and the five of us (babies included) drove to Market Square to eat at Mi Tierra and pick up some stuff for their birthday....sounds fun, but it turned out to be a sorry idea...it was freezing and raining..not good weather to be carrying a pinata to the car....I am so, so, so ready for it to be sweltering hot outside....HATE cold weather...unless I am looking at it through the window of a ski lodge with a hot beverage in my hand. I just read online that 2007 was "The Year of the Golden Pig"....sounds like something you'd read on a menu in a Chinese restaurant...and it is! Apparently, babies born in 2007 are supposed to live comfortable lives full of wealth...only comes around every 60 years. I don't read horoscopes, or buy into any of that...but if it means my babies have a chance of living extra fortunate lives, yippee!! Can't hurt 'em! I am in love with my new camera....a 10 mp Canon digital with a macro lens....I can already tell the pictures are going to be much better than with the tiny Sony digital camera. (That is, if I ever figure out how to REALLY use this fancy schmancy thing) I love that it takes three frames a second...imperative for taking pictures of squiggly ten month olds...with the old camera, it gave off about six "warning" flashes (red eye reduction most likely) that made Cale squint in all of them...I realized I was NEVER going to get a good picture of this kid unless I got a quicker camera. I also love the macro lens....I can take pictures of them without them knowing...not so important now, but it will be worth it's weight later. I need to find somewhere to take a photography class....any suggestions from readers will be greatly appreciated! -Clorox's new line of "Green" cleaning products...I am not a die hard tree hugger, but I am all about buying safer products for my house...especially since I have babies crawling (and sometimes licking) all over my floors. -Sally Hansen's new lip gloss...I am a SUCKER for new bath/beauty products...love this one! It feels like chapstick, but looks like fancy gloss. -the paint color Shawn and I picked out for our bedroom..it's called "Barnwood". Kinda gray, kinda beige...very cool! -Wal-Mart's scrapbooking stuff...actually pretty decent stuff for being so cheap. -watching the babies crawl...and squeal when they think they are in to something they aren't supposed to be in to. -Organizing....I still have lots to do, but have sorted and labeled lots of stuff. (Gotta love the label maker!!) I am a little bit OCD when I am in the middle of an organizing frenzy...but then resort back to hanging stuff on the side of the treadmill. I am not sure when you are supposed to start discipline with your children...probably when your daughter starts screaming in rage when you take something away that she wants. Hayden is now the boss of everyone in this house. For being such a sweet, happy baby, she is really starting to assert herself....my mom was buying her a dress yesterday, and Hayden had been holding it in her lap in the stroller, playing with the price tag. When we got to the checkout to pay for it, my mom took it away...and that's when it really hit the fan...the kid started growling and screaming at us, and even pounded her little fists on her chest a few times to show us she really meant business. The lady in the line in front of us gave us a look as if to say "You people are really in for it." Then Sunday, as Shawn and I sat in church....we see our number pop up on the screen from the nursery. Sure enough, as we exited the sanctuary doors, we hear Hayden screaming like she is being pinched....mind you, the baby room is still a full hundred feet or more away, but she can really project. They were standing with her in the hall, trying to make her stop crying....the girl holding her said, "I think something hurts." Which would be a good guess based on the way she was hollering...but NO. There was no pain involved....she was fine as soon as I took her outside. We tried to go back in to get Cale and our diaper bag, and she screamed as soon as I took one step towards the door. Shawn had to go get him alone because she was having none of it. I know this is the tip of the manipulation iceberg, but I am not sure she is young enough at this age to work with. I think for now, we are going to have to just keep other people's ears safe from bleedage, and do what she wants. It is a pain sometimes, but still cracks us up because they are starting to show more and more of their personalities....they actually have really obvious likes and dislikes....they are tiny little people. (Or a tiny little dictator in her case) It still amazes me how different they are....Cale can bang his head on something (hard) and keep on truckin'....Hayden, on the other hand, cries if the wind blows on her sideways.